The Christ in Prophecy Journal: Turmoil in Egypt - Is it Prophetic? Is the turmoil going on in Egypt prophetic? Egypt has torn itself apart as their people riot and their military topples one government after another. What started out as the Arab Spring uprising has turned into a dark winter for Egypt. Hope naively is in the air that democracy and freedom will replace the old order, but fear is also tangible as the specter of Islamic Sharia Law rises to choke Egypt in its militaristic submission to Allah. Delving below the politics, students of Bible prophecy are deep in discussion over whether Egypt is engaged in some kind of prophetic fulfillment. A recent "Christ in Prophecy Journal" blog poll of 354 people looked to see where people believed Egypt stood in the prophetic light. As expected, 170 respondents (48%) wisely chose that it was too early to tell. Still, 71 respondents (20%) believe Egypt is experiencing Isaiah 19, and 63 respondents (17%) believe we are witnessing the beginning of the Psalm 83 prophecy. To a lesser degree, some believe Ezekiel 38-39 or Daniel 11:40-45 are in order. Some even, after the close of the poll, suggested Ezekiel 29:12 is beginning. While Isaiah's oracle against Egypt certainly sounds relevant to today with Egyptian rising up against Egyptian for or against the latest government, it is still up in the air whether they will be given this cruel tyrant to rule over them. 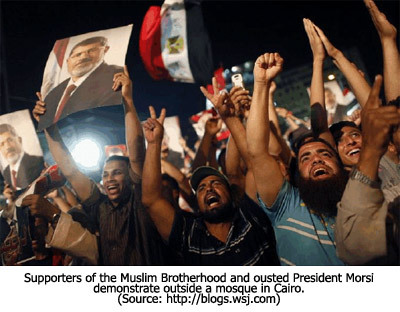 It is indeed possible that the Muslim Brotherhood will regain power among the turmoil and place the people under strict Islamic law. Or, this could ultimately be talking about the coming Antichrist. Prophetically, it could be that Egypt has started on the path of Isaiah 19's prophecy which starts with Egypt's fall, but without a shadow of a doubt Isaiah 19 describes Egypt's final future in Christ's Millennial Kingdom. Along with Jeremiah 12:14-17, it is revealed that Egypt as a nation will make it into Jesus' Millennial Kingdom, though populated by believers, and not living under any judgment. Are the Egyptians facing a desolation and scattering of its people for 40 long years? One would think so until they read on to Ezekiel 29:19 and 30:10 which shows that the Lord promised that He would "put an end to the hordes of Egypt by the hand of Nebuchadnezzar king of Babylon." Historically then, although there's no archaeological record of this happening, we can take the Bible at its word that this event happened over 2,500 years ago. A slim possibility exists that there may be a future fulfillment of Ezekiel 29 as well. During the coming Millennial Kingdom, if any nation doesn't send representatives to Jerusalem for the Feast of Tabernacles, they will then suffer drought (Zech. 14:16-19). The Egyptians are singled out in this warning, which suggests they could also see a 40-year exile during that period if they persist in their stubbornness, making Ezekiel 29:12 also yet future. I give this only a very slight nod of the head, though, because God's praise for Egypt during the Millennium recorded in Isaiah 19:23-25 would seem to rule out the harshness of exile. If anything happening in the Middle East today is fulfilling Bible prophecy, it is that we are witnessing this very day the formation of these coalitions. Iran has set up proxy states through Hamas and Hezbollah and no matter who comes to power in Egypt they still seethe to wipe Israel off the map. Israel has the world's most effective army which could easily subjugate those neighbors. Israel could not defeat Russia along with Iran and Turkey coming from multiple fronts, and so God will have to step in, just as He told Ezekiel He would. The fall of these Middle Eastern governments today is endangering any peace treaties made with Israel and solidifying the relationships between these Islamic nations against Israel. The danger level towards Israel is being kicked up to maximum and it is possible that any day soon we could see a Psalm 83 scenario unfold. Earlier in Daniel 11 we get a stunning play-by-play of the ongoing battle between the dynasties of Alexander the Great's generals. These kings are consecutively labeled the "King of the North" (Syrian Seleucids) and the "King of the South" (Egyptian Ptolemies). This portion of prophecy was fulfilled in such jawdropping accuracy in the decades following Alexander the Great that it's led some to claim that Daniel was written after their fulfillments. Egypt is certainly wrapped up in this prophecy, but it's very much a Tribulation-centric prophecy and not something we are seeing in today's headlines. No matter who rules Egypt, the peace treaties with Israel are coming to an end. Unbounded by treaties, armed by Iran, and united by Islamic hatred of all things Jewish, all prophetic indications reveal that the nations surrounding Israel will attack in a Psalm 83 scenario. Following sometime soon after, an outer ring of Muslim nations will attempt to destroy Israel based on Ezekiel 38-39's Gog-Magog Battle. We are very close. 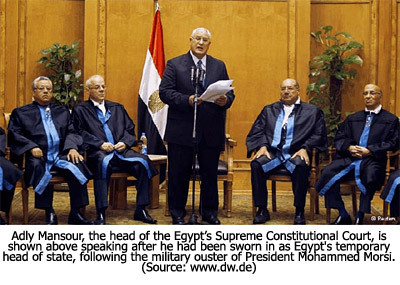 Article: "No matter who rules Egypt, the peace treaties with Israel are coming to an end. Unbounded by treaties, armed by Iran, and united by Islamic hatred of all things Jewish, all prophetic indications reveal that the nations surrounding Israel will attack in a Psalm 83 scenario." My first reaction...I don't think so. The countries surrounding Israel and such disarray that they are in to position to launch such a type of attack that would require a crushing blow response from Israel. My second reaction...Well, I didn't think the Berlin Wall would ever fall either and yet I watched in amazment as it happened. So what do I know? My final reaction...I give in. We are so close now to the worldwide powder keg exploding that yes, the Psalm 83 events CAN happen BUT I still think Gog/Magog will follow soon after. I still DON'T accept the Salus "Israelistine" myth. The polling data informs me that by a greater than 2:1 margin the poll respondents do not see the ongoing revolution and resultant civil strife in Egypt as being a part of the process of Isaiah 19's fulfillment. Ditto for Psalm 83. 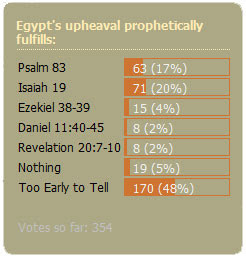 I am with the 71 respondents who view the Egyptian situation as being the process of the fulfillment of isaiah 19. What most Christians seem to not understand is that Bible prophecies of a geo-political nature come to their fulfillment over long periods of time. That is how the affiars of men transpire - over multiple decades, years and months. Event cascade into those that are subsequent or follow-on results. Psalm 83, for example, has been a process of fulfillment for the past 65 years. The wars described by Gabriel between the Macedonian Greeks of Seleucid and Ptolemaic Empires occurred over 106 years. More than a century, and they were ended with the rise of Rome to Empire status (precisely as prophesied) who put the forerunner antichrist Antiochus IV Epiphanes in his place, ultimately destroying and absorbing his empire along with the Ptolemaic. Gabriel's prophecy then suddenly morphs and launched forward over 2,000 years into one involving the Antichrist during the 70th Week. This is the nature of geo-political prophecies in God's Word. I also disagree that Psalm 83 references Egypt directly. I believe the Hagarenes are Arabs, as distinct from Biblical Egyptians, and who lived and still do live in the region of the western Persian Gulf from Kuwait to Bahrain. The closest I see Psalm 83 getting to Egypt would be the Amalekite nomads who lived the Sinai and western Saudi Arabia. They may well be the Bedouin tribes of the Sinai today. Assume Israel defeats the Arabs and they are crushed and defeated. Assume God defeats the Russian coalition and they are completely destroyed. Then why in the world does Israel need to have to sign a peace treaty with the a/c if all their enemies are defeated and destroyed? Billy, not for Israel's sake, but the Antichrist's. With God winning Gog-Magog and the whole world terrified of Israel, the AC would likely need Israel to stay out of his business while he goes off to conquer the world. War-weary and busy with cleanup, Israel would likely be responsive. Only after the AC has taken over the world do we see him setting his focus back on Israel for the Great Tribulation portion. Thanks for the confirmation. That is what I suspected but wasn't sure. While I don't think this is the mark of the beast, I think it demonstrates that people will being willing to accept it when the time comes. Thank you for such an informative article packed with scriptures to back up how you view all this. I too am quite concerned. I pray the Christians in Egypt and the hostile areas of the neighboring Israeli countries are able to flee. I do pray for their safety. You said secular Israel would accept God (though not His Son until the end of the Tribulation). I always thought the Two Witnesses during the Tribulation would preach the Gospel in Israel and throughout the world during the Tribulation. Will the Jewish people not accept Jesus Christ during their Evangelizing at all? Keep up God's work. I am so glad that Lamblion is finally focusing on biblical prophecy. There are times some articles are not pertinent to prophecy and cause a bit of a stir between Christians. This seems to make Lamblion a bit defensive and comments are made against others. Awesome Nathan,thanks so much I will save this and reread and study as so much info. Read,today that Russia and China walked out on talks about USA and Syria while meeting about such..... So many things lining up and many threats against Israel if USA goes against Syria. When will,we be out of prophecy? Don't see us at the end. It gets curiouser and curiouser. On Friday the 12th of March-1976 a Holy Bible of unknown provenance was carried by the lapping ripples of the Nile to the bank below Virgin Mary Church located in the Maadi district in Cairo. The site of the present Church of the Virgin Mary is closely associated with the Holy Family when they came to Egypt. The bible was open to the page of Isaiah 19. The Bible is now behind glass in the Sanctuary of the Virgin in the Church for all to see. I am a christian copt living in Egypt. I am witnessing extraordinary changes since the beginning of the Egyptian revolution. I strongly believe that a miracle is currently happening to Egyptians. In my opinion, God has eliminated the corruption layer introduced by Mubarak regime and lately God is removing the Evil layer supported by MB for 80 years. Now for the first time the majority of Egyptians who supported MB in the past are realizing that this is Evil and they are in the process for reaching the true freedom ( freedom of thinking ) and this is the true miracle that happened to Egyptians over the past year! MB is promoting hate, violence, destruction. For decades MB and extremists are terrorizing minds and this was in my opinion the big barrier. Egyptians are seeking the true God and the terrorism of the mind was a major obstacle for reaching the truth. 30 June 2013 is the second wave of the revolution that gave Egyptians the freedom of thinking. Now you can feel an unprecedented transformation on the social/spiritual level which will eventually lead in my opinion to what is mentioned in Isaiah 19.21 And the Lord shall be known to Egypt, and the Egyptians shall know the Lord in that day. Unfortunately the West don't see it that way! You should be deeply engaged in the Egyptian culture to feel/appreciate what I am trying to describe. All American Christians should be with our Christian brothers everywhere, praying for each other. I pray for you and all Egyptian Christians. It is a blessing to know Egypt will some day look to our Lord. Our bible looks like a manual for what is going on in the world now and is setting up for all the prophecies you listed. Yet people scoff or ignore--- just like told in the bible. I have a hope that people read these articles and see this truth. Please continue to point out these current events and the bible scriptures that tell of them ,they will open the eyes of many who scoff or have grown cold. I was listening to Patriot radio on XM (since John Kerry was blathering on FOX). The Patriot radio host had a theory that Obama is manipulating this Syrian crisis in such a way as to try to lead to the destruction of Israel. His scenario sound just like Psalm 83. I don't know if this host knows anything about Bible prophecy or not. If not, it was interesting to hear someone talk about the scenario outside of a Bible prophecy discussion. This convinced me more than ever that yes, Psalm 83 IS real and yes, this COULD be the triggering event. I also have NO problem believing the closet Muslim (not so closeted in my eyes) Obama is in the corner with the Arabs and against Israel. Wow very interesting Billy. I have also read secular sites that say the oil / natural gas situation is an issue. Russia and Saudi going head to head. Our economy 'needing' help will side with who has control,of these resources. This will be a 'hook' for all nations. False flag anyone? Wow again what a time we are living in.